Even where snakes are common, they can be difficult to observe because they are shy and easily disturbed. Through good fortune and patience we’ve been able to record brief moments in the lives of wild snakes. These portraits of behavior may oppose what many (most?) people imagine snakes do. 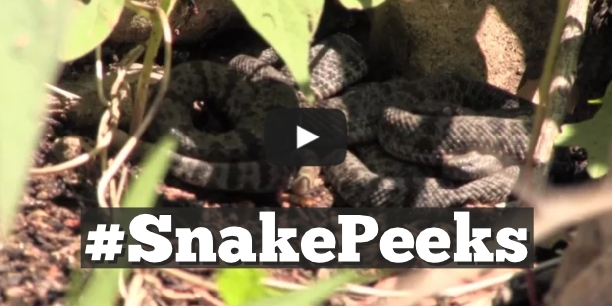 Please enjoy and share widely – help us show the world the true nature of snakes! This timelapse video shows a sunny spring day at a snake den sheltering Arizona black rattlesnakes and striped whipsnakes (music: Presentiment of Inner Storm by HighWay17). Kokopelli cozies up to his two littermates under the protection of their mother, Woody (song “Wook” courtesy Podington Bear). A juvenile black-necked gartersnake has discovered a shallow pool hosting toad tadpoles. Watch him forage, capture, and swallow little tads! A few moments in the lives of a group of newborn rock rattlesnakes.